The Whetstone Studio for the Arts building was nearly destroyed by the raging Whetstone Brook it overlooks. Owner David Parker has brought it back to life for a second time. This month's Gallery Walk includes a couple of very special community celebrations that were spurred by the approaching anniversary of Tropical Storm Irene. 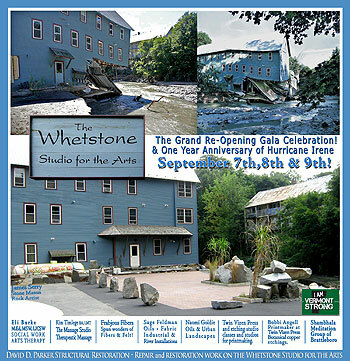 The first is at the WHETSTONE STUDIO FOR THE ARTS building, 28 Williams Street, which the Whetstone nearly destroyed during its raging rush to the Connecticut River. Owner and restoration specialist David Parker applied his years of experience to bring it back to life ... for a second time! The artists and practitioners who fill its revitalized spaces are throwing a three-day party on September 7-8-9 to celebrate the building's Phoenix-like return. Come see the fruits of all their labors, enjoy Anon's Thai food, and lively music. Hours on Friday are 4 to 9, Saturday 1 to 9, Sunday 1 to 6. Check out listing #4 for an overview of participating folks. More details are available online at thewhetstonestudioforthearts.tumblr.com. The other major event during Gallery Walk is FLAT STREET RISING! -- set in the middle of Flat Street, which will be closed to traffic during Walk hours. This street-fair-style event, from 4 to 8 pm, involves music, games and family activities, and dancing in the street to a variety of musicians from Samirah Evans and Her Band of Love, Tom Woodbury, and the Loft's Youth Percussion Ensemble, among others. The organizations who created this event are focused on sharing the many positive and creative after-school and weekend opportunities available to youth in the area, as well as helping businesses work toward full economic recovery. There will be entertainment, demos, and hands-on experiences by In-Sight Photography Project, New England Youth Theatre, The Boys and Girls Club of Brattleboro, New England Center for Circus Arts, Brattleboro Music Center, Open Music Collective, Buzzards Brass Band, and River Gallery School, among others. The Circus Arts folks will set up their high-flying aerial rig to wow everyone!